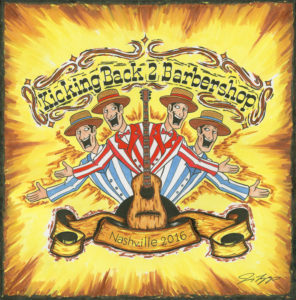 The 2nd installment of the Kicking Back To Barbershop series. Kicking Back 2 Barbershop has more quartets than ever before! KB2B now has 2x the Swedes, 2x the Gold Medalists, and ∞x the women quartets! //// Tracking, Mixing, Mastering Engineer: Joshua Arizmendi //// Album Artwork Artist: Jimmy Trapp //// A big thank you to James Pennington, Emma Michel, Jason Portell, The Album Sponsors, and all the Quartets who participated this year! You are helping secure the future of Barbershop Quartet singers! What is Kicking Back 2 Barbershop? Kicking Back To Barbershop started in 2015 when I wanted to help the Youth Barbershop Quartet Competitors get to International. I got 11 Quartets together and recorded 11 non-contest songs and sold the album for $5 with an infinite donation ceiling. Kicking Back To Barbershop raised over $1850 for Harmony Foundation’s Scholarship for Youth competitors. Now this is the line up for this year’s album with 12 Quartets singing. Funds: This year since there are more quartets, that means there are more songs to be licensed. Which also means that the production of the album will be higher. Last year I helped fund about $200-$300 to start the album with the help of Song Sponsors paying for the processing fee for royalties. This year I’ll do Album Sponsors instead of Song Sponsors since the cost is greater this year. 12 Album Sponsors of $50 will financially start the album so that the rest of the album donations will be given to Harmony Foundation International. Last year we were able to donate over $1850 to Harmony Foundation, let’s try doubling that this year! © 2019 Recording With Josh. Theme by XtremelySocial.